Mohandas K. Gandhi was born in 1869, in Porbandar, India. Mohandas was from the social cast of tradesmen. 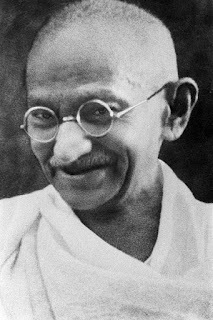 His mother was illiterate, but her common sense and religious devotion had a lasting impact on Gandhi’s character. As a youngster, Mohandas was a good student, but the shy young boy displayed no signs of leadership. On the death of his father, Mohandas traveled to England to gain a degree in law. He became involved with the Vegetarian Society and was once asked to translate the Hindu Bhagavad Gita. This classic of Hindu literature awakened in Gandhi a sense of pride in the Indian scriptures, of which the Gita was the pearl. On completing his degree in Law, Gandhi returned to India, where he was soon sent to South Africa to practice law. In South Africa, Gandhi was struck by the level of racial discrimination and injustice often experienced by Indians. It was in South Africa that Gandhi first experimented with campaigns of civil disobedience and protest; he called his non-violent protests satyagraha. Despite being imprisoned for short periods of time, he also supported the British under certain conditions. He was decorated by the British for his efforts during the Boer War and Zulu rebellion. Gandhi also encouraged his followers to practice inner discipline to get ready for independence. Gandhi said the Indians had to prove they were deserving of independence. This is in contrast to independence leaders such as Aurobindo Ghose, who argued that Indian independence was not about whether India would offer better or worse government, but that it was the right for India to have self-government.